This approach to life resulted in three vintage Puritan traits: the ideal of the God—centered life, the doctrine of calling or vocation, and the conviction that all of life is God’s. The Puritans’ sense of priorities in life was one of their greatest strengths. Putting God first and valuing everything else in relation to God was a recurrent Puritan theme. Of course, it takes vigilance over one’s actions to produce a holy lifestyle. Very tellingly, the Puritans repeatedly used such words as watching, exact walking, andmortification to describe their preferred lifestyle. Stressing the God-centered life can lead to an otherworldly withdrawal from everyday earthly life. For the Puritans, it produced the opposite. Richard Sibbes sounded the keynote: “The life of a Christian is wondrously ruled in this world, by the consideration and meditation of the life of another world.” The doctrinal matrix that equipped the Puritans to integrate the two worlds was their thoroughly developed ideas on calling or vocation. A particular calling consists of the specific tasks and occupations that God places before a person in the course of daily living. It focuses on, but is not limited to, the work that a person does for a livelihood. Several important corollaries follow from this doctrine of vocation. If daily work is as central to the spiritual life as the Puritan doctrine of vocation asserts, it is no wonder that the Puritans threw themselves with such zest into their work. We need, of course, to draw a distinction between the original Puritan work ethic and the secularized perversion that followed. 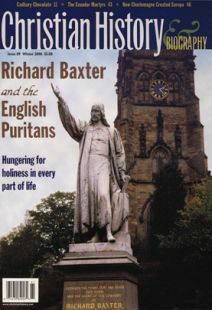 The original Puritan work ethic was this: “Be laborious and diligent in your callings … ; and if you cheerfully serve [God] in the labour of your hands, with a heavenly and obedient mind, it will be as acceptable to him as if you had spent all that time in more spiritual exercises” (Baxter). An additional genius of the Puritans was the skill with which they managed to view all of life as God’s. The Puritans lived simultaneously in two worlds. For them, both worlds were equally real, and life was not divided into sacred and secular. In such a framework, there are no “trivial” events, and all of life is potentially a teachable moment. One Sunday morning when the young Robert Blair had stayed home from church he looked out of the window to see “the sun brightly shining, and a cow with a full udder.” Blair remembered that the sun was made to give light and the cow to give milk, which made him realize how little he understood the purpose of his own life. Shortly thereafter, he was converted while listening to a sermon. There was no place where the Puritans did not find God. They were always open to what Baxter called “a drop of glory” that God might allow to fall upon their souls. • Choose that employment or calling … in which you may be most serviceable to God. Choose not that in which you may be most rich or honourable in the world. • Be diligent in your callings, and spend no time in idleness, and perform your labours with holy minds, to the glory of God, and in obedience to his commands. • Idleness is a robbing God, who is the Lord of us and all our faculties. • Take pleasure in your work, and then you will not be slothful in it. • This interest of God in your lowest, and hardest, and servilist labour, doth make it honourable and should make it sweet. • The question is, How they use that which they labour so hard for, and save so sparingly. If they use it for God, and charitable uses, there is no man taketh a righter course. • Remember that riches do make it much harder for a man to be saved. • If God show you a way in which you may lawfully get more than in another way (without wrong to your soul, or to any other), if you refuse this, and then choose the less gainful way, you cross one of the ends of your calling, and you refuse to be God’s steward. • You must not desire nor seek to get another’s goods or labour for less than it is worth. • You have far more cause to be afraid of prosperity, than of adversity; of riches, than of poverty. • The devil suiteth his temptations to men’s daily work and business. Leland Ryken is Clyde S. Kilby Professor of English at Wheaton College in Wheaton, Illinois. Difficult man + difficult woman = model marriage. Oldest church discovered, Christian history in the movies, rare book by Roger Williams. After the Restoration, Protestants persecuted Protestants like never before. “Though dead, by their writings they yet speak.”—George Whitefield.